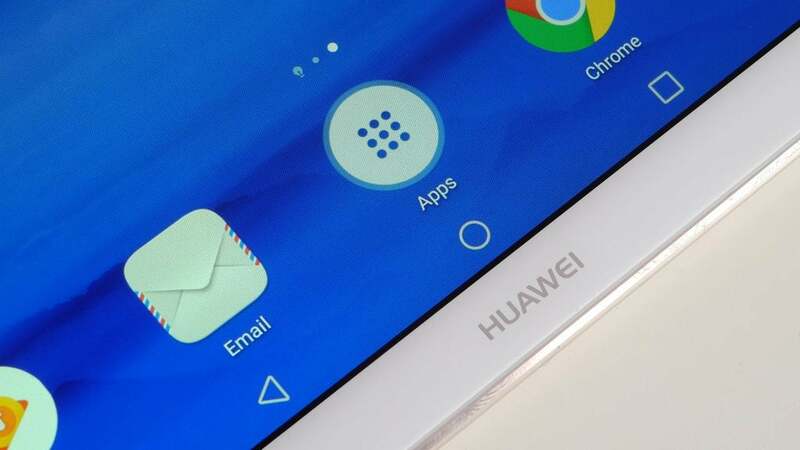 What is the Huawei MediaPad M5 Pro? The Huawei MediaPad M5 Pro is an Android tablet. A few years ago a “Pro” tablet would often use Windows, a hallmark of serious and studious tech. 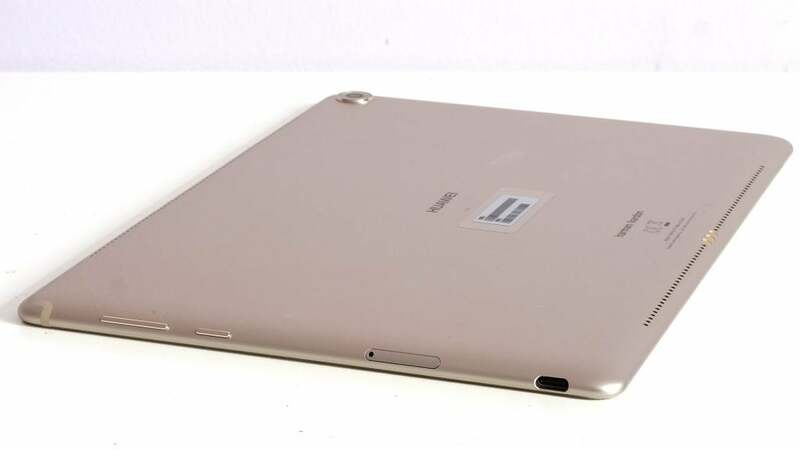 Huawei MediaPad M5 Pro price: Prices start from 499 euros rising to 599. We’ll update this piece when he have confirmed UK pricing. However, this tablet mixes the fun with the serious. And there’s more of the former. The Huawei MediaPad M5 Pro is a slightly less desirable, but significantly cheaper, alternative to the iPad Pro 10.5. It has a stylus, you can get a keyboard base for it, and it has high-end hardware. 4G is an option too. It isn’t the ideal tablet to replace a laptop, but for those who want to mix digital creativity with a good old tablet veg out, the Huawei MediaPad M5 Pro is great. Hear “pro tablet” and you may think of something like the Microsoft Surface. It’s there for work, but can have a bit of fun on its downtime. I don’t think immediately of a tablet like the Huawei MediaPad M5 Pro. It looks just like any recent 10-inch Android tablet. That’s not a slight: many phones and tablets have converged on a thin aluminium shell as a hard-to-beat formula. It’s light gold on the back, Gorilla Glass on the front. And at just over 7mm thick the Huawei MediaPad M5 Pro is about as slim as you could hope for. However, its shape is different to those of its two main rivals, the Samsung Galaxy Tab S3 and iPad Pro 9.7. Both of those have 4:3 aspect displays. The Huawei MediaPad M5 Pro has a 16:10 screen, and is therefore longer. 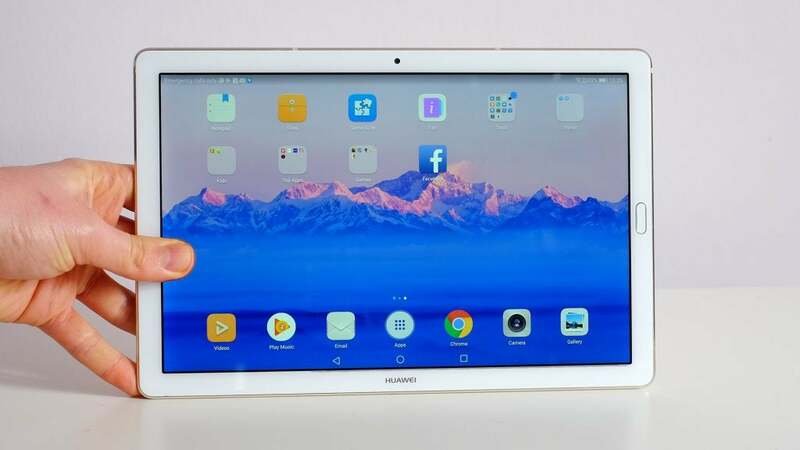 Where the Samsung and Apple alternatives come across as portrait tablets, the Huawei MediaPad M5 Pro seems much more at home on its side, held between two hands. The other style is better for apps, browsing and casual games. This 16:10 shape suits video. Given the choice I’d pick a 4:3 tablet. However. I have enjoyed using the Huawei MediaPad M5 Pro a lot. The speakers have a lot to do with this. 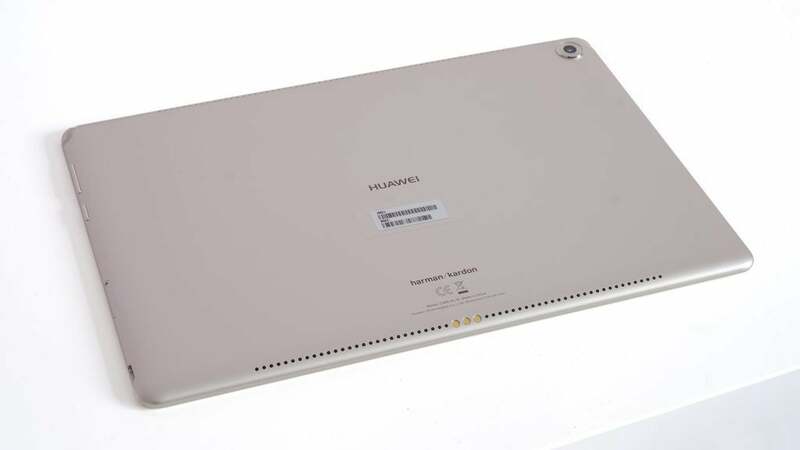 There are four Harman Kardon speakers on the Huawei MediaPad M5 Pro. Two above the screen, two below it. While they may not blow an iPad’s out of the water, they are remarkably fat-sounding. Their sound really blooms out of its top and bottom. The engine noise that fires-up when you load Gameloft’s Asphalt 8 sounds great (for a tablet) through these speakers. You can treat this tablet a bit like a Bluetooth speaker. One evening I used it to listen to a podcast while in the bath. TMI? This tablet isn’t waster resistant, though. It also lacks a headphone socket, which seems a shame. This thing is absolutely perfect for wasting time on YouTube while propped up in bed. And while the speakers are great for this situation, you’ll need to use an adapter if you have wired headphones. One disappointment worth noting is that, like the MediaPad M5 8.4, this tablet doesn’t support Netflix at native resolution or even 1080p. While its hardware is fast enough, easily, it hasn’t been certified for these higher-end streams. There’s also nowhere to keep the Huawei MediaPad M5 Pro’s stylus inside the tablet. 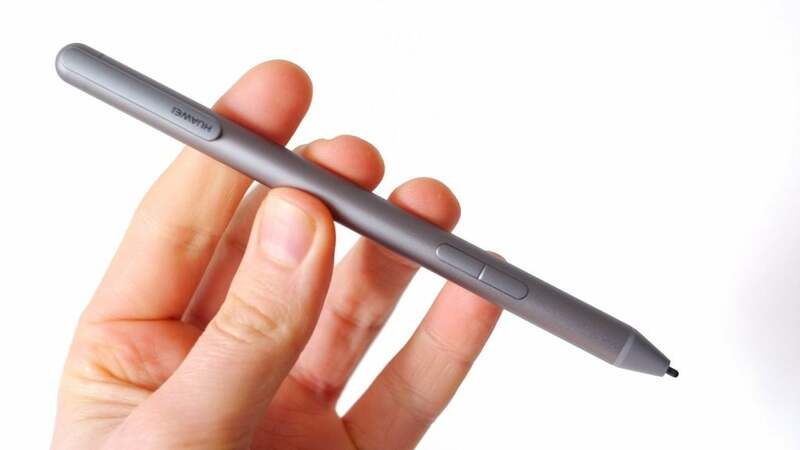 However, with a digital pen like this you either need to use a stick-thin stylus like the Samsung Galaxy Note series, and fit it in the tablet. Or forget that idea and use a more pen-like design. You get a proper pen here. It feels great, a metal cylinder with a couple of buttons and a rubber-like tip texture for better feel. Swipe its tip across the Huawei MediaPad M5 Pro’s screen glass quickly and you will feel a bit of slippage. It’s not quite like a pro grade graphics tablet. However, it’s not 100 miles off. There’s no obvious latency here, which in older stylus tablets would leave the line you draw tailing behind the actual pen. Pressure sensitivity is also great, with 4096 levels. That’s the same number as the Wacom Intuos graphics tablet. The Wacom has a better-textured surface, but short of buying a Wacom Cintiq or Mobile Studio Pro this is one of your best options. You could also buy a matt screen protector for the tablet, which would affect image quality but also makes the surface feel less “glassy”, increasing friction. The pen is charged using a USB-C port that appears when you twist its top. Clever. Huawei says a charge will last up to 50 days. The Huawei MediaPad M5 Pro has a 10.8-inch LCD screen. It’s not as big as the screen of the large iPad Pro, and actually still seems a little smaller than that of the 10.5-inch iPad. Apple’s iPad screen is wider, this one is longer. But if you use the tablet as a drawing surface, the width means more. The widerscreen aspect of the Huawei MediaPad M5 Pro is better for movies, though. It leaves less blank space taken up by black bars. Quality-wise the screen is very good, if not quite at the level of the Samsung Galaxy Tab S3 or iPad Pro. It doesn’t have the contrast of the OLED Samsung or the colour accuracy of the iPad Pro. It’s also not the brightest tablet display around either. However, if you’re going to use it primarily indoors, even if that’s the “indoors” of a train or plane, it’s hard to see how you could be disappointed. It’s a good-looking, large, sharp display. The amount of time I’ve spent watching YouTube on the Huawei MediaPad M5 Pro in the last couple of weeks is frankly unhealthy. It’s hard to think of a better tablet for the purpose. 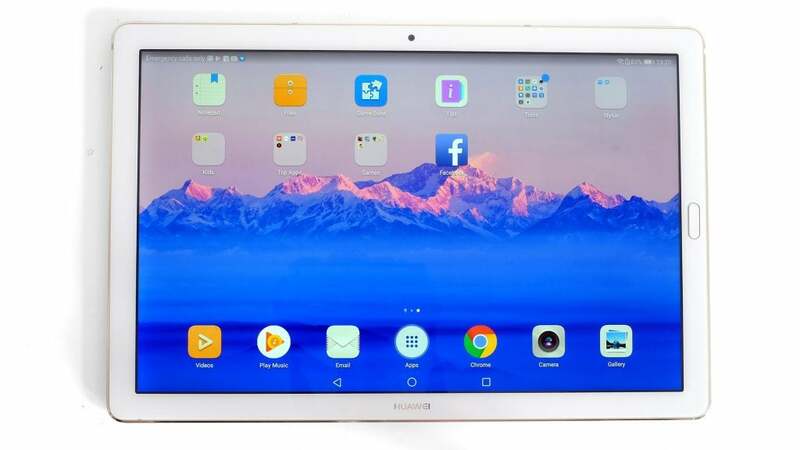 The post Huawei MediaPad M5 Pro appeared first on Trusted Reviews.